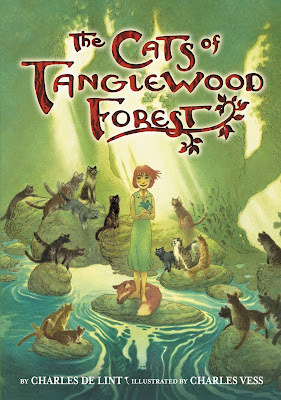 I don't often read children's fiction that isn't YA, but one look at the recently published The Cats of Tanglewood Forest was enough to convince me that this was a good idea. Yes, I judged the book by its cover, and it worked out very well for me. The Cats of Tanglewood Forest was written by the renowned Charles de Lint and illustrated by Charles Vess. Apparently, it's a further exploration of a picture book they wrote and illustrated together a decade ago, A Circle of Cats. I'm glad they decided to expand it. Not only is The Cats of Tanglewood Forest beautifully written and illustrated, the book itself is absolutely gorgeous. I wish I'd had this book when I was little, but even as an adult it's still wonderful. The story is, on one level, whimsical, although I think that the idea that all cats are magic explains more than it doesn't. I love how much agency Lillian had, that her decisions defined her story and that she simply would not allow herself to be fit into an easy categorization. If there is a moral of this story, it is to consider our choices carefully, because actions have consequences: not good or bad, necessarily, but that our choices shape our lives and our world. And I think that's a wonderful message to send, but the book isn't that explicitly didactic. Like the best children's fiction, there's a lot going under the surface when you stop to look. Mostly you don't, though, because you're distracted by other things, like a girl having an adventure and magical cats. The Cats of Tanglewood Forest delivers on every level. I don't know about this one. The book cover looks amateurish. I guess people do judge a book by it's cover. Though, I'll give it a try. Do you just review new releases or old stories as well?